You could that at our house, Christmas 2016 started on November 1st. That’s just how things fell this year with family visits. Nanny (Dave's Mum) came from England on the 3rd, and a week after she returned home, we took a quick trip to Connecticut for an early holiday with my family. In any case, by the time new year hits, we’ll have been “Christmas-ing” in our way for two full months. So you’d think we’d have had our holiday-fill by now. Only this year, the merriment and twinkle-strings of dazzle in the form of beloved holiday traditions is proving harder to relinquish than ever, and here's why: There is a present-shaped piece of craft foam, bespeckled in glitter and labeled “Felix’s room” in sloppy red Crayola marker, hanging on the doorknob of my sleeping three-year old’s bedroom. This is the tip of the why. Inside that room, said three-year old is curled up peacefully beside his white, personal mini Christmas tree adorned with favorite decorations and topped with his handmade Santa, a celebration of shapes: cones, triangles, and circles. And that lightly snoring, blissful boy LOVES Christmas. He has been singing carols since July. Here is the iceberg. I’m not really sure what kind of time frame is required to constitute a true family tradition, or how much evolution can be transpire for one to still qualify as traditional. But I am full of gratitude for the warmth and cosiness of some of the simplest, quietest may-be-traditions we've been sharing together these last few years. Things like transforming the kitchen table to a glitter, glue and paint station for homemade cards; stockings first in little F's bedroom Christmas morning; lights and decorations teamwork. 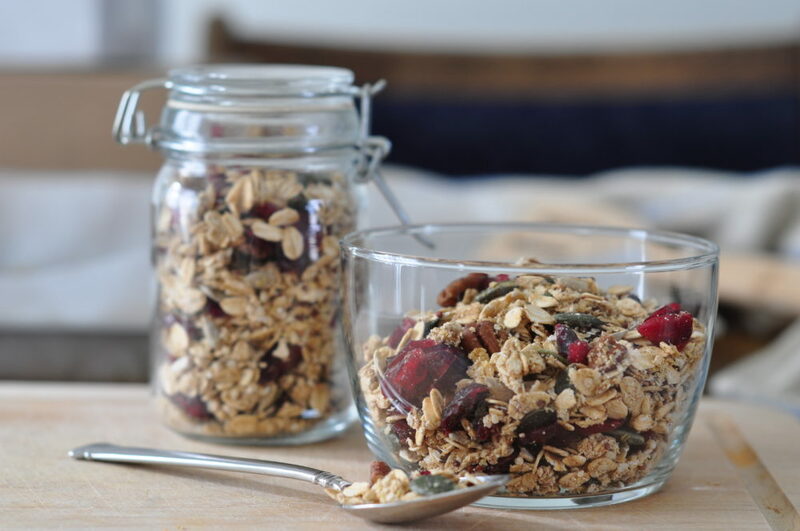 I know, we don't really need recipes for granola. I mean, the whole point with granola is to freely play and create, right? On the other hand, it's always worth having a solid template, and since creating this one for Ancient Harvest a few years ago, this has been my go-to bare bones starter. It has never let me down and doesn't even really require any measurements...just toss together, swap and add at will. It's even hard to overbake/burn. It's a splendid way to emphatically declare a bowl of porridge Christmas Eve-worthy, and much more delightful than oatmeal. And then the next day, we dive into Santa pancakes. So we're a little clingy this year, and laying out the things we're already missing it's clear it’s not actually Christmas we’re clinging to. It’s truly the spirit, which is kind of beautiful. Little F loved wrapping presents for others, carefully and creatively constructing elaborate blockades to keep the recipient out of bounds while preparing his/her surprises. We're still making construction paper, crafty presents just so we can wrap them. He loves the lights, the music, the sharing, the cookie baking and hot cocoa. His joyfulness from those simple holiday traditions coupled with a mama who annually immerses in the Hallmark channel all December (or, actually, the Netflix equivalent) and feels excruciatingly aggrieved each January by the abrupt shift in messaging from giving to me-focused momentum...and we’ve kind of got a perfect storm in our little house for some major post holiday blues. There are many magical things about traditions. One biggie, there is always room for new ones. And one of many magical things about having a loving and spirited little person in the house is that there is no better time to develop fresh and fun ones, every day even. Today was a warm and gorgeous winter day that felt like spring. The open, clear blue sky invited a different sort of giddy expectation. It was too perfect not to make a small self-declaration, that maybe this year I could trial a new tradition of greeting the new year with actual welcome more than wistfulness. There is good reason to be in love with today. Our kitchen table art can see a release from wreathes and trees and instead invite in the bold and fanciful 'emergent curriculum' that is whatever the day will bring. That's just one thing, but enough to smile about. Happy New Year!